Specialty Fuel Additives Market size was over USD 6 billion in 2015, with estimated growth of more than 6.5% from 2016 to 2023. Rise in high toxic emissions due to growth in the manufacturing sector along with increased usage of vehicles has induced the law makers to make stringent regulations across the world, which is driving specialty fuel additives market. Upsurge in biofuel consumption across various industries will augment the specialty fuel additives market size. One of the widely-used biofuels is ethanol, which acts as an additive to gasoline. 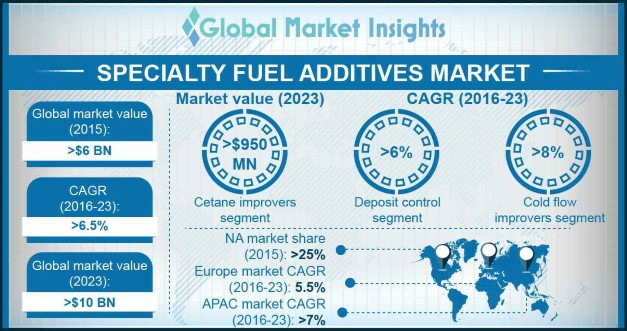 With growth in the global annual consumption of ethanol from 21.8 billion gallons in 2012 to 25.6 billion gallons in 2015, fuel additives market is set to witness strong growth. Environmental Protection Act of the U.S. has made it mandatory for heavy vehicles to use cleaner diesel with low sulfur content. Low sulfur content requires cold flow improvers which is a type of specialty fuel additive. Hence, this act is expected to positively influence the U.S. specialty fuel additives market. In the U.S., consumption of ultra-low sulfur diesel (ULSD) containing 0-15 ppm (parts per million) in 2012 was stated to be 1,255.5 million gallons. Additionally, use of corrosion inhibitors (which is a type of specialty fuel additive) for protecting the fuel distribution and storage systems in automotive will also drive the global specialty fuel additives market. Growing usage of alternative fuels like compressed natural gas (CNG) and liquid petroleum gas (LPG), may act as challenge for specialty fuel additive products. Deposit control specialty fuel additives market consumption is expected to surpass 3,800 kilo tons with CAGR exceeding 6% up to 2023. They are used in gasoline and diesel to control and remove deposits such as soot and sludge which cause harm to the vehicle engine and reduce performance. Increasing global motor vehicle production (more than 90 million units in 2015 from 80 million units in 2011) will positively impact specialty fuel additives market share. Cetane improvers are used in diesel to reduce ignition delays in the engine. It also improves cetane number leading to better performance of the vehicle. Increasing preference towards fuel economic measures is expected to drive the cetane improvers market. The global cetane improvers market will exceed USD 970 million by 2023 owing to increased ULSD consumption. Cold flow improvers market is anticipated to witness gains over 8% with volume share of approximately 7.5% in 2023. Gasoline fuel additives market volume consumption by 2023 is expected to exceed 1,100 kilo tons. Top Tier Detergent Gasoline (TTDG) formation in the US is expected to drive the regional industry growth. TTDG is performance specification designed, supported and followed by key automobile manufacturers. These additives contain more effective detergency, and free from deposit forming metallic additives. Diesel application will be driven by the APAC region with estimated gains over 6.5% by 2023 owing to substantial usage of diesel in Asia, particularly India, China, Indonesia and Thailand. Diesel is a more polluting fuel as compared to gasoline, which makes additives critical to increase the economy of the vehicle. North America specialty fuel additives demand will be driven by U.S. which is major market for gasoline and diesel. U.S consumption of gasoline and diesel was around 8,750 thousand barrels per day in 2010 and exceeded 8840 thousand barrels per day in 2013. Corresponding to the growing fuel consumption, by 2023, the U.S specialty fuel additives market will surpass USD 2.5 billion. Europe, led by UK and Germany specialty fuel additives market was worth over USD 1.5 billion in 2015 and will witness 5.5% growth during forecast timeframe. Asia Pacific specialty fuel additives market was driven by India and China, and together accounted for over 40% of total volume consumption in 2015. APAC is expected to grow at CAGR exceeding 6% during the next 8 years. This can mainly be attributed to growing demand for automobiles in India due to increase in disposable income. Specialty fuel additives market share is partly consolidated and competitive, as the top industry participants accounted for below 50% industry revenue share in 2015. Some of the major companies include Innospec Inc, Chemtura, Infineum, Lubrizol corporation, BASF SE and Baker Hughes. In December, 2015, Chemtura announced plans to expand its production capacity for antioxidants (ADPAs, a type of specialty fuel additive) in Italy. This expansion includes building a new manufacturing facility. In 2014 and late 2015, the company increased ADPA capacity at Elmira site in Ontario, Canada. Global fuel additives market is anticipated to exceed USD 8 billion by 2023. Fuel additives increase the fuel efficiency of vehicle and leads to better performance. Global fuel additives market is currently witnessing strong growth owing to increasing demand for ULSD. ULSD requires an extra dose of fuel additives for smooth performance of vehicle. North America and Europe regions have implemented stringent carbon emission and environmental regulations. Hence, fuel additives which serve these purposes of fuel efficiency and low carbon emission are witnessing strong growth across the globe.